Spring Hill provided us with a space to have a stunning wedding! Food was beyond amazing (prime rib, chicken, and haddock - THE BEST), buffet style was nicely priced. Staff was GREAT! Accomodated all of our needs! The ceremony was BEAUTIFUL - the arbor overlooks the water, so pictures will be perfect when we get them back, they have an amazing background. We just celebrated our amazing wedding at Spring Hill!! We could not have picked a more perfect place. Mindy and Rosalie were very accommodating and responded promptly to all the questions we had with the planning process. All the staff were so friendly and helped out with the smallest details !! This place really is the whole package, the food is amazing, the scenery is beautiful, and we are receiving so many compliments because our guests had a great time. Thank you for making our day so perfect!! My Mother in Law had free reign for the Rehearsal Dinner and she picked Spring Hill. 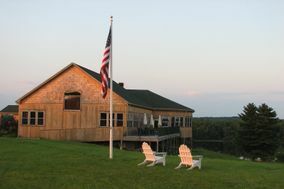 Located off the beaten path in South Berwick, Maine, it overlooks a beautiful valley, with scenic vistas and ponds. She did all the communicating with the venue, so I believe everything went without a hitch. They allowed us to set up lawn games outside the function hall which was extremely appreciated. Their bar selection was great, and the staff was polite, and genuine. They were wonderful to interact with throughout the night. The food was delicious. We did a lobster bake, which unfortunately, wasn't really a lobster bake. It was lobsters or a choice of chicken/steak/other. It would have been nice if they provided an authentic Maine Lobster Bake experience, but their menu was still delicious. Clams weren't on the menu, but my father doesn't eat lobster, so Spring Hill made him a special meal. His only complaint was that, in an effort to serve the entire table at once, some food didn't arrive hot. Flavors were spot on. Thank you Spring Hill for a great Rehearsal Dinner! My husband and I chose Spring Hill after hearing great reviews about them. They were one of the more affordable venues in the area, and pre-wedding they were helpful so we weren't worried about having any problems with them. The day of the wedding, the coordinator (Joy) was not there. This wouldn't have been a problem if there had been someone there to direct questions to, but there wasn't. Decorations that had been promised to be put out were not, plans that we had gone over with Joy were not executed. A lot of the tasks that were supposed to be carried out by the staff were pushed off on to my guests, which made me feel very tacky. The venue is very nice and the food was good, but as far as service they didn't follow through on anything we had gone over, which I was led to believe is their basic protocol for weddings at their facility. If I had been prepared to do more work myself then I probably would have given them a better rating, but I was told the staff would be taking care of these things so I planned accordingly. When I brought my concerns to their attention via email, they ignored most of what I had to say and didn't even offer an apology. My last email was sent about a week ago and I have received no response and honestly don't expect to. So much thought goes in to planning a wedding and to have so much of that fall through was really disappointing. I expected that people in the business of throwing weddings would be understanding about that. I know some people have had a great experience here, but I wouldn't recommend it based off my own experience.